Case Study by Rebecca Benison. A digital media professional with 7 of years of full-time writing and social media experience wanted to expand her freelance writing portfolio and earn additional income. She had been working full-time for a marketing agency and occasionally took on freelance assignments as offered through her alma mater – she’d worked at the University’s Office of Public Affairs throughout college, and maintained a relationship post-graduation. While the pay offered by the University was fair, the volume of work was typically low. For this reason, she decided to look for new sources of freelance work. While there were numerous freelance writing opportunities listed on job boards, many required full-time availability, and the ability to write on-location in an office. Already having a full-time job, the writer was unable to commit to these terms. She was looking for freelance assignments that could be done during the evenings and on weekends, outside of work. Anything that interfered with her day job was removed from consideration. When LinkedIn introduced the ProFinder platform, it was a great way for service providers to find paid assignments that met their interests and skills. The writer updated her profile to make it clear that she was an experienced freelance writer, and sent proposals in response to queries that interested her through the platform. Initially, though she got some responses back, she wasn’t able to secure any assignments, and could see that numerous pitches were being sent to the same assignments she was interested in – typically ongoing blog requests or one-off feature assignments. Eventually, LinkedIn changed the ProFinder platform so that only upgraded (paid) LinkedIn accounts were able to respond to queries. Since she hadn’t yet earned any income through the platform, it didn’t seem like a worthwhile investment to upgrade her account. However, she was still able to see queries that were posted on the platform, and was still receiving emails about assignments that she might be interested in – she just couldn’t respond to them directly. While she couldn’t respond to queries directly in ProFinder, the writer was able to find a work-around. Within each query, the profile picture and headline for each person posting a request was included. Though there were no names given, the writer was able to copy and paste the headline into the Search bar and look for the profile picture that matched the one in the query. Once again, she couldn’t send a message without having an updated profile. However, she could include a personalized note if she sent a connection request. With this information in mind, she updated her strategy and sent connection requests to people she found through ProFinder, and included proposals in her introductory notes. Most people accepted the connection requests, but didn’t respond to the notes. In these cases, the writer typically waited a couple of days before following up with another message. 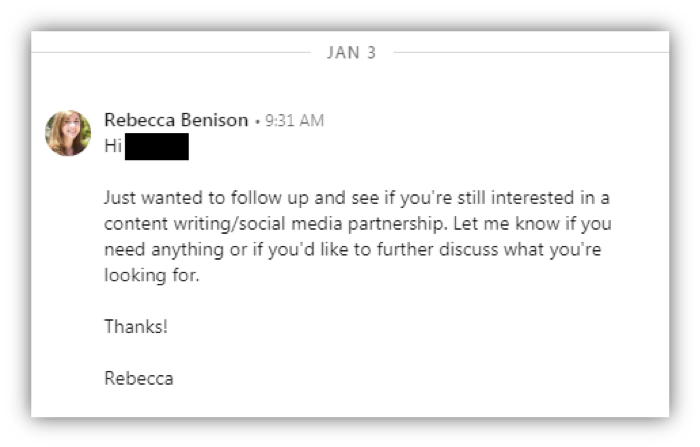 Below is an example of an initial pitch included in a connection request, as well as the follow-up message that was sent after two days without a response. The response included the client’s phone number. The writer called later that day to discuss the client’s needs and work out a reasonable payment structure. The client owned a number of local car dealerships, and was looking for someone who could write short-form emails as well as long-form blogs and press releases. They moved forward with a plan that took into account the varied content types and lengths of different assignments. By reaching out directly through a connection request, the writer was able to get in front of the prospective client and follow-up to keep herself top-of-mind. By connecting, she was also able to showcase her experience and work samples through her own personal LinkedIn profile. Through this particular engagement, she earned $250 in her first month with this new client. It provided a decent source of additional income, as well as a replicable example of how to find and onboard new freelance clients. Add yourself to ProFinder, even if you don’t have an upgraded account. Optimize your personal LinkedIn profile – add relevant work experience, writing samples, keywords, specialties, etc. In your headline, make sure it’s clear that you are a freelance writer. Only send connection requests to prospective clients if they have expressed a need for freelance writers. DON’T send unsolicited pitches! You want to come across as helpful, not spammy. Nobody likes to be sold to (until they’re ready to buy). Keep your personal notes short and to-the-point when sending connection requests. Mention that you saw their ProFinder request, and are responding to that post. Highlight your background and why it’s a good fit for what they need. Mention some prices up-front. Everyone has a budget they need to stick to, so it helps to know pricing ahead of time when considering multiple pitches. If you’re negotiable, mention that in your note. If your prices are firm – just name the price and leave it at that. Once a connection request has been accepted, wait a few days before following up. Many people are turned off when new connections bombard them with messages to solicit business. Keep follow-ups simple and friendly. Remind them why you’re writing and what you have to offer. Ask if there’s anything they currently need help with. Keep the lines of communication open. Engage with your clients’ posts on LinkedIn every so often, especially if requests for work have slowed. It’s possible they’ve been busy with other things, and those small interactions serve as a reminder that you’re there to help. I have 21 articles that no one ever reads on Linkedin. I would love to develop contractual relationships for article writing or copywriting with Linkedin members. The biggest and most important thing I learned from this piece is. that there are always work arounds if it something you truly want to do. The ideas presented here will be helpful in being sure to update. My profrofile to weight it towards previous writing experience. Great article and advice, Jacob! Perhaps you might add detailed instructions and/or screen shots on how to add yourself to ProFinder. It took me a few minutes, and some teeth gnashing, to figure it out. For those having the same issues, when you go to ProFinder https://www.linkedin.com/profinder click on the drop-down arrow next to your profile pic at the top right of your screen. Click on where it says “Are you a Pro?” and go from there! Thank you again, Jacob, for all you do. I’ve found this technique more helpful for short-form writing work than for editing and book ghosting, which are my chief professional areas. 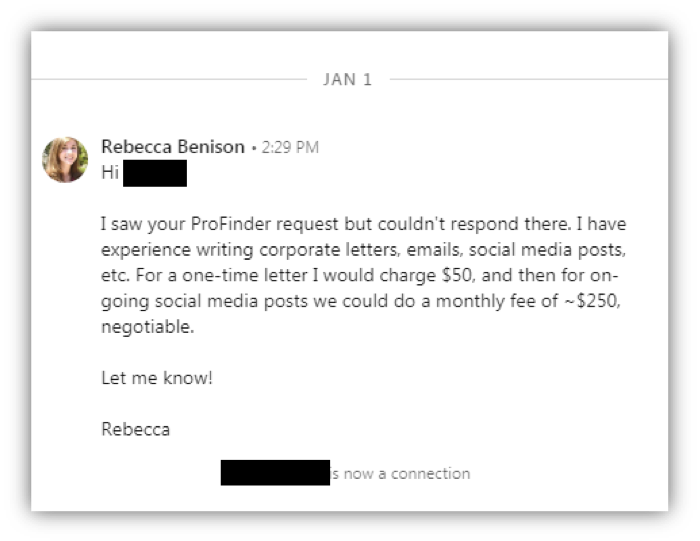 I had a deeply unsatisfactory experience with ProFinder Premium, which I wrote about here: https://www.linkedin.com/pulse/hey-linkedin-dont-patronize-me-carolyn-roark/. Hopefully it will help other freelancers and self-employed professionals from wasting precious time and $. Wow this was an awesome read. Thoroughly enjoyed it. To the point and elaborate at the same time. Seems quite helpful as I am a newbie at freelance writing. So this will assist in putting up a good LinkedIn profile. There is a good point.